Congratulations to all MOE Service Excellence Award (MSEA) 2017 Winners! 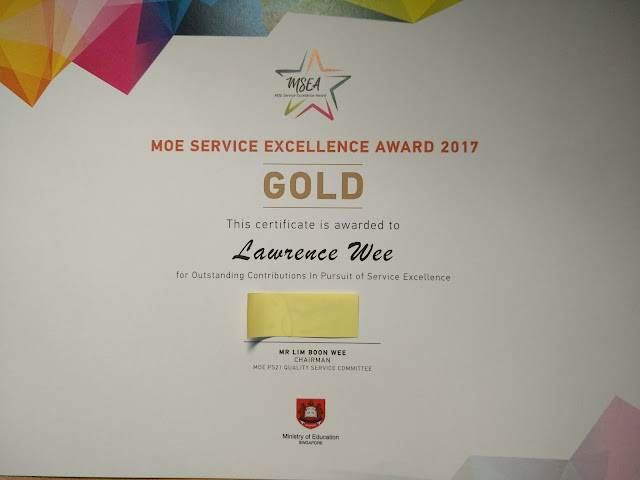 Thanks to Lily for the kind nomination! 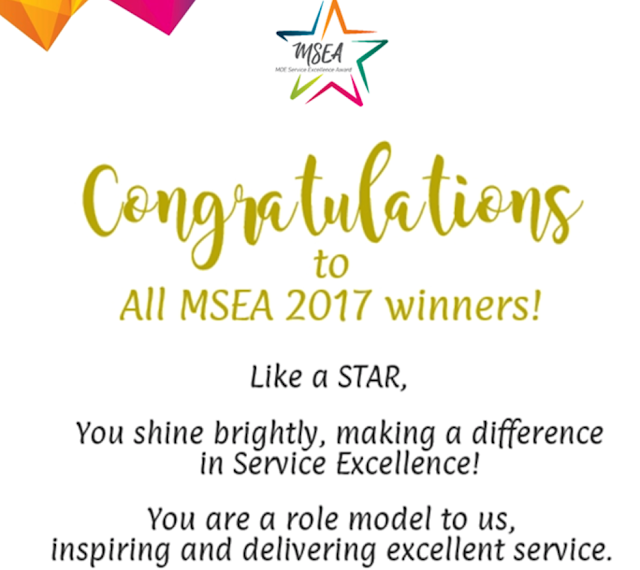 The MSEA recognises MOE staff who are passionate in their service delivery, consistently serve internal and external customers with C.A.R.E (Courtesy, Accessibility, Responsiveness and Effectiveness), and inspire their colleagues to do likewise. 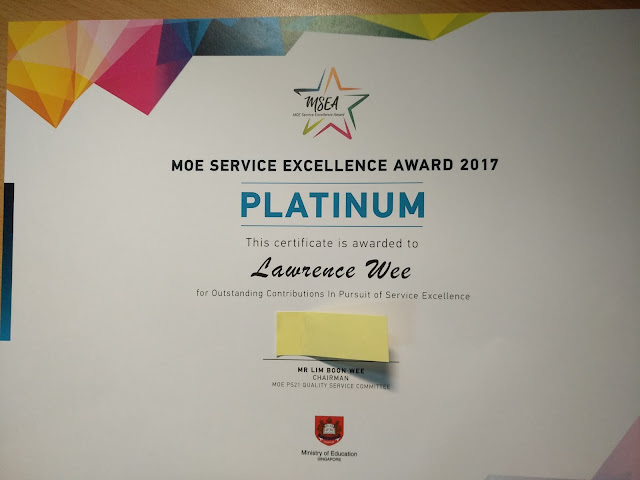 As a result of collaboration between ETD and CPDD science learning community in use of ICT, CPDD Tze Kwang expressed his thanks to Lawrence for supporting this effort. Ashik, a school teacher was surprised and “grateful” (usually workshop required attendance for workshop materials shared) and thank Lawrence for sharing very detailed step and step screenshots on an email invitation to join in 07 Feb, 1430 - 1730 hours, eduLab@AST (Block J Level 4) 2, Malan Road, Becoming Scientists through video analysis workshop, despite the fact he was unable to attend due to school commitments. Due to the digital open culture of sharing by Lawrence, many teachers benefited from the educational technology tips and how-to just by visiting his blog and digital library. Seng Kwang, teacher who attended Lawrence’s 4 day workshop in creating simulation in Nov 2016, emailed Lawrence to share his own physics 3D computer model. Seng Kwang thank Lawrence for “enlightening” him in the ways of coding physics simulations. In LT Anna's Lesson, students being instructed to use the app for telling time to the nearest one and half hour. Later, student broke into groups to test their ideas using the app. ETD Senior Specialist Track Research Fund on “Explore-Useful Learning Math Apps” aims to create Primary Math interactive resources to support ICT Masterplan 4 goal of “Quality Learning in the Hands of Every Learner - Empowered with Technology”. As part of the project, open sourced Mathematics learning resources, compatible with almost any mobile devices are developed. Initial research findings indicated that teachers and students are better able to use ICT meaningfully via our service improvement initiative. The ICT practices are accessible (Licenses creative commons attribution), adaptable (Open source codes) and affordable (free of charge). In MTT Theresa’s Lesson, students were engaged in Primary Maths Addition digital card game, with features “odd” “even” changing target number etc. for creative fun with adding.